Amazon S3 buckets – what are they for and how to use them? What is Amazon S3 bucket? S3 stands for Simple Storage Service, and Amazon S3 is AWS storage service, where objects such as photos, videos, documents, etc. are organized into so-called buckets. The service provides you with APIs to manage your resources, i.e. objects and buckets. Else, to make things easier you can choose to use Amazon S3 console to work with them. To create on Mac Amazon S3 bucket, you can use either the console or an AWS SDK, a collection of tools for developers. At this stage you need to give your bucket a name and specify a region. All Amazon S3 buckets should have unique names not only within your region but globally. As for the regions, there are 13 of them. Choosing the one closer to you will help you optimize latency, spend less and comply with local laws and regulations. To access buckets on Amazon Mac owners can again use the console – an ideal solution for those who are not into coding – or URLs, either path-style or virtual-hosted-style, for those who prefer to do it programmatically. You can configure your Amazon S3 bucket for website hosting and managing the lifecycle of objects. There is also an option that allows logging all access to the bucket. Buckets are owned by AWS accounts that were used to create them, and transfer of ownership is not possible. Although there is a way to go about it: if you would like another account to own your bucket, you can empty the bucket and delete it. After a while the name of the deleted bucket can be reused; it is theoretically possible to create a new one under the same name and fill it in with the required objects. You have to be careful though – in certain cases the name of a deleted bucket might not be available at all for a number of reasons. The default setting allows creating 100 buckets for each of your accounts; the limit can be increased at request. You can upload to S3 bucket any number of objects. Amazon S3 offers a convenient web interface for it users, but if you prefer working with online data directly from your Mac, CloudMounter is what you need. 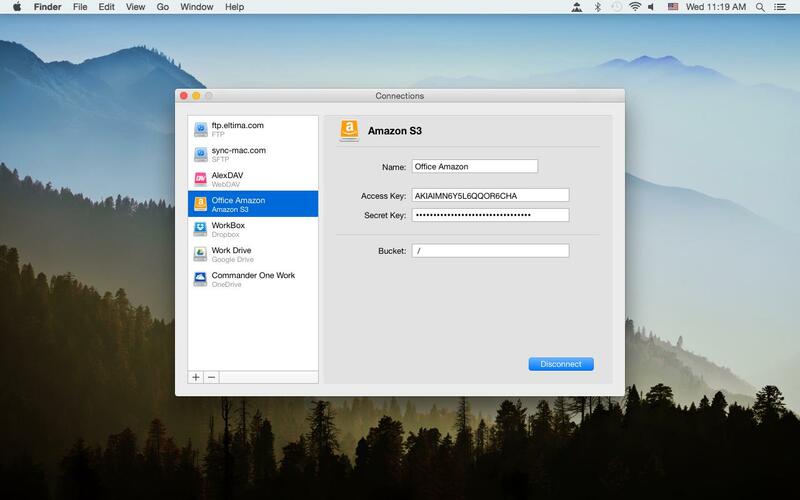 This application is Amazon S3 client Mac users could make use of . Integrated into Finder it allows you to mount Amazon S3 as drive on your Mac so you can access and manage data stored there as if it were right on your machine’s hard drive. You can tell the app whether to mount S3 bucket or several of them or the entire account. All AWS regions are supported.